Chennai, India, February 11, 2019 : Today NWSD technologies has launched Ojoy branded Kids smart watch phone with dedicated Kido OS – the world first animated Android OS dedicated for Kids smart watch.Tastefully designed with a modern, compact profile and light weight. Ojoy A1 gives an all- rounder performance to every Ojoy A1 kids. Kido OS is powered by Android. Kido OS, the first ever animated OS for kids smart watch. Main Menu itself explains the main function of the watch, call, message, family & friends, activity, etc. The UI is animated and each swipe on touchscreen, switches the function and animation theme. Android is a mobile operating system developed by Google. It is based on a modified version of the Linux kernel and other open source software, and is designed primarily for touchscreen mobile devices such as smartphones and tablets. In addition, Google has further developed Android TV for televisions, Android Auto for cars and Wear OS for wrist watches, each with a specialized user interface. Variants of Android are also used on game consoles, digital cameras, PCs and other electronics. Powered by Qualcomm Snapdragon Wear 2100 platform is designed to bring new and enhanced wearable experiences to your next smart watch. Available in both connected (4G/LTE and 3G) and a tethered (Bluetooth and Wi-Fi) version, the Snapdragon 2100 is defining the new standard in wearables processors by enabling, sleeker designs and longer battery life. “For parents being connected to their kids when they are not around is important. This has sparked the need for cellular connected wearable devices for kids everywhere. 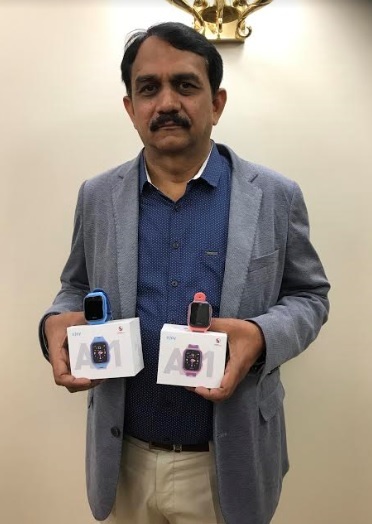 A ruggedized wearable device which can be simple and affordable will address this demand of parents to be always securely connected with their kids, communicate easily and ensure they are safe. A highly affordable and growing 4G network in India complemented with an affordable cellular kids smartwatch solves a big pain point for most parents to be always connected with their kids. Further, a smart but fin-filled kid’s smartwatch also makes it fun for kids to wear this gadget.